Wednesday August 20 1884 I was sewing most of the time today. A heavy shower at noon. Hat came over after dinner and brought Robbie. Lee took Mollie Stevens home tonight and Archies brother and cousin who were here last night went to the valley this morning. Thursday August 21st 1884. We had washing done today. Hatt and the children are still here. I went to town before dinner. Mother and Rob were out riding all the afternoon We girls were sewing and Ida did part of the ironing. A card from Mary Briggs they come tomorrow night. Friday August 221884 I helped a little with the ironing and was working on a calico dress for Mother. She and Rob were out riding. Lee went to the depot but the folks did not come. 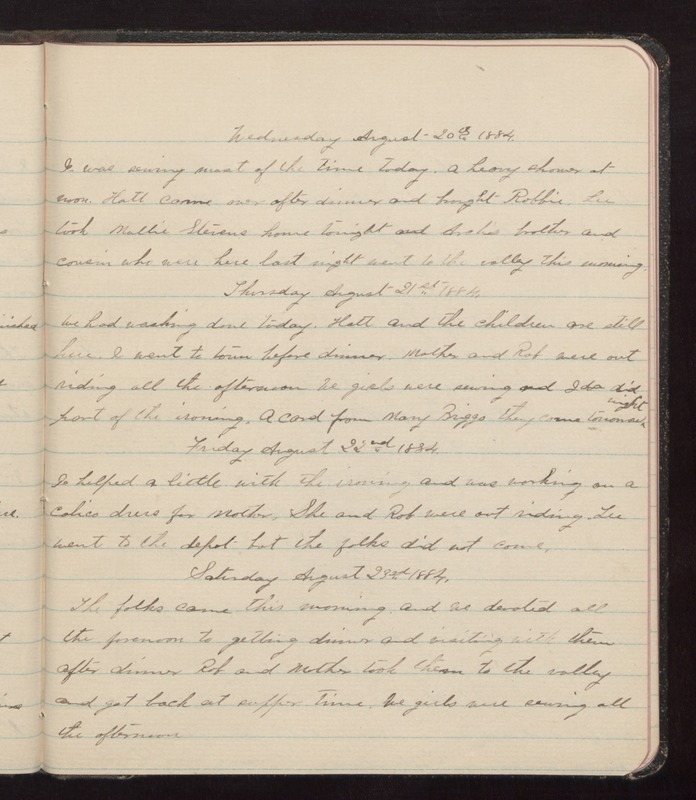 Saturday August 23 1884 The folks came this morning and we devoted all the forenoon to getting dinner and visiting with them after dinner Rob and Mother took them to the valley and got back at supper time. We girls were sewing all the afternoon.